Funeral services will be held at 10:00 AM on Saturday at the New Life Lutheran Church in Liberty for Aaron J. Seddon who passed away on Tuesday afternoon at the Hospice House in Poland. Aaron was born July 19, 1917 in Pittsburgh Pennsylvania, the son of Aaron J. Seddon, Sr. and Mabel (Baehr) Seddon. An Army Infantry Veteran discharged in 1945, Aaron went on to retire as the tire department manager at Mahoning Valley Supply in 1985. He was a member and head usher at the New Life Lutheran Church in Liberty. He was also a 50 year member and 33rd degree mason at the Poland Lodge # 766 in Youngstown as well as a 50 year member of the Aut Mori Grotto, Scottish Rite, Youngstown Shrine Club, and life member of the 4:30 Club. Aaron leaves his daughters Karen (Bob) Rusu of Canfield and Gail Chambers of Youngstown as well as his son Charles (Karen) Seddon of Poland. He also leaves six grandchildren: Atty. Robert (Cheryl) Rusu, Arlene (Richard) Pavlock, Charles (Tricia) Seddon Jr., Bryan (Lisa) Seddon, Mark (Erin) Seddon, and Jeffrey Seddon. 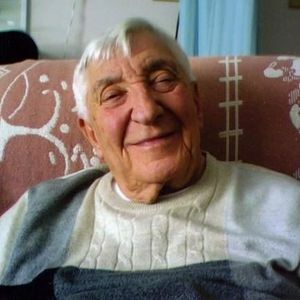 He also leaves nine great-grandchildren and his sister in law Sarah J. Seddon. He was preceded in death by his wife the former Larane Hall whom he married in 1942 and passed away in 1982. A brother Jess Seddon and two sisters: Mabel Krantz and Anna Mae Miller Hines as well as his son in law Jim Chambers also preceded him in death. Friends and family may call from 5:00 to 7:00 PM on Friday at the Lane Funeral Home Canfield Chapel where a Masonic Memorial service will be held at 7:00. Memorial contributions may be sent to the Hospice House in Poland in Aaron's name.